Dr. Brad Parkinson at RNTF & ION meeting aboard USS Constellation, 27 June 2017, RNT Foundation photo. Dr. Brad Parkinson, widely known as the “Father of GPS,” opened a presentation Tuesday night with a call for immediate implementation of an eLoran system in the United States as one of several measures needed to protect GPS and the positioning, navigation, and timing (PNT) services it provides. Here are links to the first half and second half of his presentation. 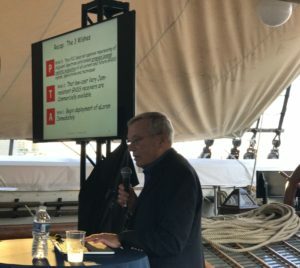 Speaking at a reception hosted jointly by the Resilient Navigation and Timing Foundation and the Washington, DC chapter of the Institute of Navigation, Parkinson described his “Three Wishes” for GPS and PNT services. 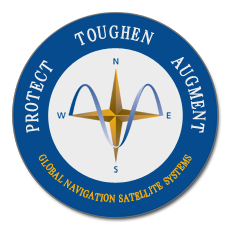 These were to have GPS “Augmented” with eLoran, “Toughened” with better receivers and antennae that have better anti-jam and anti-spoof capabilities, and “Protected” from services that would broadcast in and near the GPS frequency band and cause interference. A download of his entire presentation is available here.